Theology Ponderings: What Is God's Will? 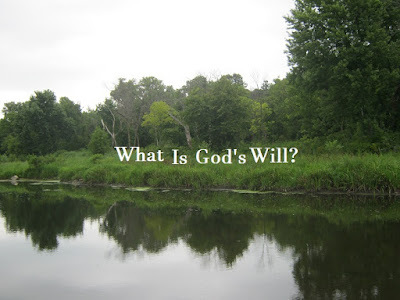 A question many people ask is "What is God's will for my life? ", especially when they're about to make a big decision such as a career move or very large purchase such as a house. It's wonderful that people have a heart to do what God wants, enough to ask these types of questions, but unfortunately, for many people, they feel the question sometimes never successfully gets answered by the people around them. It's comforted some people to know in cases with two options, that both might lead to good outcomes. Possibly one way will be slightly more pleasant, but there's no way to know at the moment of decision. So it's okay. Just make a decision. This is more of a philosophical reasoning, and may fall under wisdom, a concept that's encouraged in the Bible. There's a little more to say about how to know God's will in a situation. How God wants us to live is clearly laid out in general principles. What he wants can be said in two principles: Love God and love your neighbor. When we're considering all the options, we should weigh them against that. Can you do those things in any of the ways you can go? If it's yes to all, pray about it, and then go with your intuition and/or maybe just what seems the most appealing to you. The words "God's will" means what God wants, and he wants his children to grow and learn wisdom and to be active in the world, which means making tough decisions at time. God knows the past, present, and future, and always knows what's best, but we are different than God and he knows that. He knows we have limited vision, and he promises to be with us and help wherever we go if we have faith in and love for him. We have faith that God controls everything, and for whatever reason, there's not a clear signpost in front of us telling us which way to go. God has allowed this situation to exist, where we have to make a decision without knowing the future, but we trust his goodness anyway. And we may even learn and grow through this process. God will bless Christians wherever they go. Also, we sometimes forget that not making a choice, just doing nothing because it all seems too confusing or not clear, is in itself a decision or way. That's because time never stops. We may have missed many opportunities to love God and our neighbor while we are sitting there. While carefully thinking through decisions is good, it's not good to just not act to avoid making a tough call in life. Let's have faith and live life.